Having a garage either attached or detached from your home is one of the best amenities to have. A garage can serve a multitude of purposes, including housing storage, vehicles, and more. And while a garage can be of the utmost value, there are many homeowners who complain about their garage doors not working correctly in cold weather. Fortunately, there are several tips you can follow to help ensure your garage door functions properly all year long. Why does a garage door not work in cold weather? If you have a garage door that does not work when it get colds outside, there are many factors that may play a role in this issue. For starters, the culprit of the problem could be that the metal tracks and the metal in the garage door are contracting. When the metal contracts, it can cause the metal pieces to seize up against one another. To resolve this issue, you will need to apply some type of lubricant, preferably one that is silicone based. You will want to lubricate everything from the metal rollers to the springs. 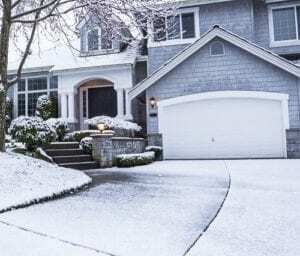 An extreme change in the temperature, such as a sudden drop in how cold it is outside, can lead to the tracks becoming warped, which is another reason as to why your garage door may not work once wintertime rolls around. If this is the case, you will need to contact a garage door repair specialist to either perform repairs or replace the tracks. Hardened grease is yet another cause of a garage door not working correctly when it gets cold outside. Almost all moving parts of a garage door are to be covered in grease, but cold temperatures will cause the grease to harden, meaning you will need to remove it with a small brush and apply fresh silicone-based lubricant. Lastly, broken springs will lead to your garage door not working, and it is common for these springs to break during cold weather. A broken spring can only be fixed by replacing it, so make sure you call a qualified garage door specialist to perform the replacement work for you. One of the best ways to ensure your garage door works properly all throughout the cold months of the year is by making sure the weatherstripping is in good shape. When the weatherstripping starts to peel or crack, this allows extreme amounts of cold air to slip between the door itself and the frame. A flat scraper along with a pry bar will be needed to remove any old weatherstripping as well as any remaining sealant. Remember, the smoother and cleaner the surface is, the easier it will be to apply new weatherstripping. If your garage door is not working correctly during the cold months of the year, contact a qualified garage repair specialist today.